To celebrate the return of metal in 2007, here are some recent concerts posted and shared on the internet. We offer you brief excerpts. Heaven & Hell is an amazing Ronnie James Dio still standing after 60 years. And still hoping to "die young". Nobody will dare call him "grandpa". They have been touring since 2006 and played enough to record one show for official release, Live! Radio City Music Hall live in New York City, March 30, 2007. Obituary have a new album Xecutioner's Return just out in August and are now on the "comeback" trail. This is their seventh album after 2005's Frozen In Time. The band have also released their first live concert DVD at the end of 2006, Frozen Alive, so there's plenty of new stuff from the fathers of Death Metal from sunny Florida. They are the youngest band here just touching thirtysomething. Finally, Van Halen roared to live with a stunning opening show in Charlotte, North Carolina. The original band is back sans bassist Michael Anthony replaced by Eddie Van Halen's son Wolfie. The internet is still debating whether Eddie or Jimmy Page of Led Zeppelin is the better guitarist. Well, you don't have too long to wait to watch another heavy metal dinosaur act get resurrected soon. 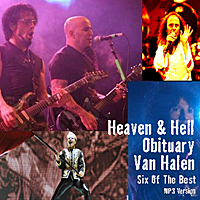 All are FM recordings with the exception of the Van Halen show which is an audience recording. You can get the full concerts by joining various bittorrent sites including the DIME site. They are shared in lossless format.